Who Really Owns the RFP Response Process? There’s a common phrase in the tech world that you can’t have it “Good, fast and cheap, you have to pick two.” Anyone who has tried to achieve all three has struggled to find the balance…good enough, fast enough and within budget. Yet despite the phrases’ popularity and known constraints, companies—especially those on a growth trajectory—continue to seek this elusive pot of gold. Two continual shifts in the marketing and sales environments have been driving teams to find the perfect balance with proactive account-based strategies and technology. So, what does that mean for the RFP response process? Some very interesting changes. Like many companies working an account-centered plan, RFPIO’s team is always looking to learn more about the people interested in and buying their software. 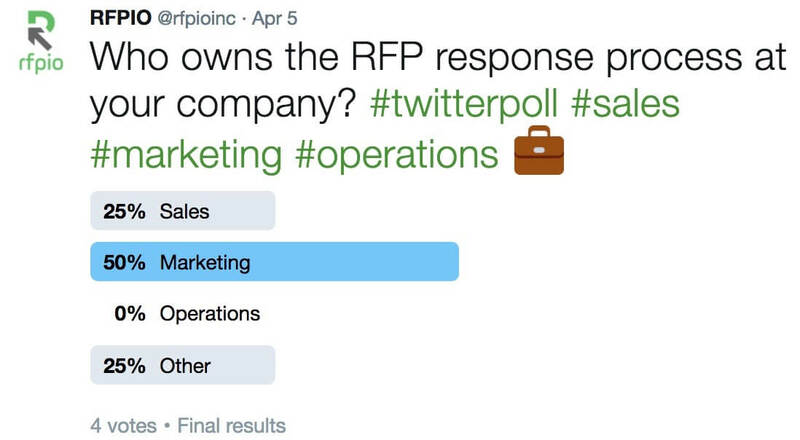 Our communications manager ran a weekly Twitter poll campaign for a month to grab some helpful bits of information she could share with the sales team. When she asked who owned the RFP process, the results were surprising. Expecting the usual suspects from sales and operations, it turns out marketing actually owned it. As you might imagine, this data point became the tip of an iceberg exploration. The entire team was eager to validate the information and to understand the buying motives for this new segment. The further the team pressed in, the more obvious the cause became. As organizations mature, the goals between marketing and sales teams begin to align around revenue. And as the team at RFPIO knows well, when done right, RFPs can be a major contributor to revenue and organizational success. Once aligned around the same goals, it’s very common for marketing to own a greater percentage of opportunity creation. When this happens, we see a shift in the budget. Frequently the head of marketing—rather than sales—has the dollars to generate new business, including RFP responses. Not surprisingly, Gartner’s 2016-2017 CMO Spend Survey reported that marketing budgets continued to increase for another consecutive year, comprising up to 12% of total company revenue in some cases. 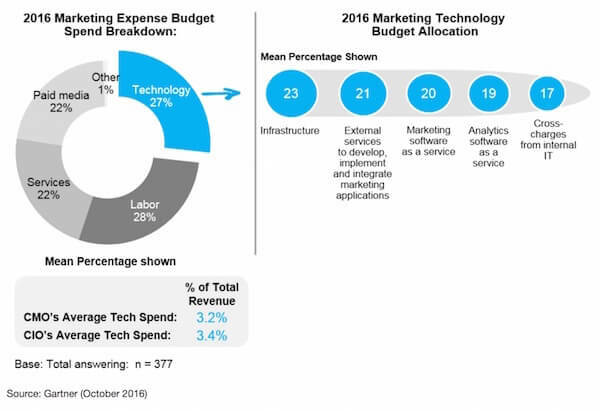 A closer look at the detail behind these numbers reveals that almost a third of the average marketing budget is spent on technology. Another level deeper and you’ll see that much of this (44%) goes toward infrastructure or external service technology. Once a cost center, over the last decade marketing has shifted. The shift caused shockwaves of changes in the business landscape with the most obvious…marketing technology. We created technology which created data, then we created technology to make sense of all the data we created. Then we created technology to predict the future. 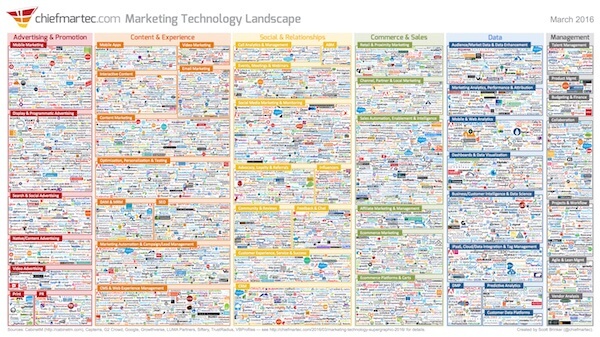 Among the vast sea of marketing technology, RFP response software sits. Alongside CRMs, marketing automation, and project management platforms these solutions are all tuned to help the organization deliver a strong and growing revenue stream. With more than half of companies still managing this process manually, it will be exciting to see how marketers—now technology aficionados—integrate this emerging solution into their stacks. The emergence of marketing operations has been a realization that technology alone cannot solve problems. Technology must be paired with processes that are customized to the company’s needs and desired results. Like most processes, RFP response involves stakeholders from all over the organization. Executives weigh in on vision and growth, client success puts in a story or two, product development puts together feature lists and solution-oriented descriptions…and the list goes on. As natural collaborators, marketing sits among the many contributors. Experienced in crafting messaging and ensuring brand consistency, marketing was the natural hub to oversee the production of a deliverable that can land the deal. So, it turns out that marketing plays a much bigger role in the RFP response process—and in today’s MarTech landscape, it makes perfect sense. Marketers continue to play an integral role in the long-term success of an organization. We’ll continue to see marketing doing much more beyond the buff and polish before the RFP deliverable goes out the door. Ownership by marketing, driven by the latest technology, will help more companies find effective ways of responding to RFPs to ultimately win more business. Angela Earl is an experienced leader in marketing operations and the intersection of sales and marketing processes. Angela is the President and Principal Consultant at Haatzama Marketing, a Portland-based marketing services agency where she serves as a strategic advisor to growing technology and software organizations.